Pour the water into a medium heatproof bowl and add unflavored gelatin. Stir and let it sit until the mixture puffs up, about 2 minutes. Fill a small saucepan, that can hold the heatproof bowl, with a couple inches of water and bring to a simmer. Place the bowl with gelatin on top, stirring occasionally, until gelatin completely dissolves, about 2 minutes. Remove from heat. Add the milk and Coronado® Dulce de Leche Caramel to a small saucepan set over medium heat. Stir until fully combined, about 1 to 2 minutes. Pour the mixture into the bowl with the diluted gelatin and mix well. Set the bowl over an ice bath and let mixture cool and begin to set. In a stand mixer, fitted with the whisk attachment, beat the heavy whipping cream until it holds soft peaks. Be careful not to overbeat. Gently fold the cooled dulce de leche caramel mixture into the whipped cream until fully combined. Don’t overmix, so you won’t lose much volume. Pour the mixture into a 6 cup ring mold, bundt pan, or 6 individual ramekins (of 6 to 7 ounces). Cover with plastic wrap and chill for at least 2 to 3 hours before serving. When ready to serve, remove mousse from refrigerator. 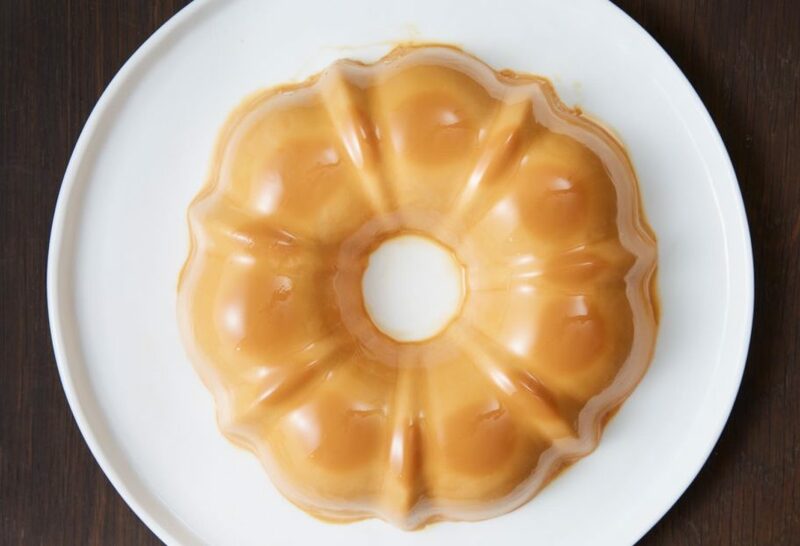 If using a mold or bundt pan, invert the mousse onto a platter. Top with berries, if desired, or chocolate salami.